Caption : BANGALORE: 17/05/2010:A view of bending Coconut Trees at outskirts of Bangalore is the common scene from last fifteen days. 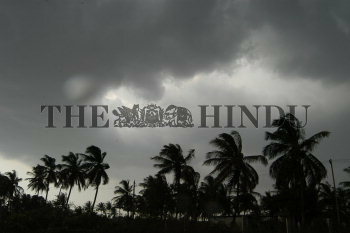 Most parts of the city plunged into darkness after gusty winds blowing at a speed of 70 kmph, accompanied by heavy rain, lashed Bangalore for about half-an-hour, uprooting about 60 trees and bringing down several electricity poles on Sunday evening. from last 15 days rain with strong wind damaged all over the Karnatka over 1000 trees were uprooted. Photo: G R N Somashekar.